Meihuaquan, or Plum Blossom Boxing, is one of the few Chinese hand combat traditions to have generated substantial interest beyond the bounds of martial arts studies. This style, possibly originating in Jiangsu and later popularized in Northern provinces such as Anhui, Shandong, Heibi and Henan was popular in marketplaces across the region during the Qing dynasty. The art still survives as a folk style and cultural system in the same region today. The Boxer Uprising (1898-1900) was responsible for bringing this practice to the attention of a number of western historians. Seeking to better understand the sources and underlying causes of peasant revolutions in Northern China, scholars in the second half of the 20th century scoured the region’s social, economic and political history looking for events that foreshadowed the later Communist Revolution. One of the most commented upon was the Boxer Uprising. Joseph Esherick’s award winning volume The Origins of the Boxer Uprising, was not the first to note the prominence of the Meihuaquan tradition in the area where the “Boxer’s United in Righteousness” eventually rose up. Yet it was probably more widely read outside of the more specialized literature than any other. While much of Esherick’s exploration of the Boxer Uprising was dedicated to a careful geographic, economic, political and social history of the region, he also detailed the history and development of a number of local martial arts societies, movements and militias. Better yet, his discussion of this material was lively and engaging. Memory is a funny thing, but I believe that I first decided that Chinese martial studies (as well as martial arts studies more broadly) was a viable research area after looking at Esherick’s treatment of the topic. Fortunately for us he spent quite a bit of time on the Plum Blossom Boxers. While the movement that became the Boxer Uprising was not a direct continuation of this community (in fact, the main body of Meihuaquan teachers moved to distance themselves from the new faction) there is no doubt that comparisons throw a good deal of light on both movements. More recently anthropologists and social scientists interested in village life in current day China have once again turned their attention to Meihuaquan communities. Of special interest to these scholars is the current social functions that Plum Blossom training and ritual plays in the life of rural communities in northern China. How have these traditions persisted in the face of decades of persecution? Why do individuals continue to turn to them today? How do they reinforce identity? Lastly, can their unique social institutions continue to survive in the face of rapid social change? Since starting this blog I have come in contact with multiple independent groups of scholars doing field research on exactly these questions. For a folk style, Plum Blossom Boxing seems to have attracted an unexpected amount of scholarly attention, both in China and the West. The following post reviews and discusses a recent article, published in a Chinese journal of physical culture, which might otherwise go unnoticed by many students in the West. While one part of a larger research project, the paper titled “Background of Meihuaquan’s Development During Ming and Qing Dynasties” By Zhang Guodong and Li Yun (both of South Western University) attempts to tackle a number of historical questions surrounding this style. I first became aware of the work of Zhang Guodong while talking with Prof. Thomas A. Green (Anthropology, Texas A&M) about some of his more recent research. 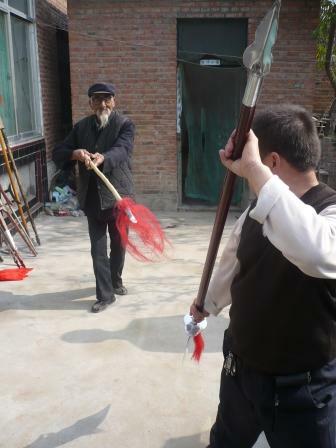 The two have been collaborating on a project looking at Plum Blossom Boxing in Shandong, Hebei and Henan. Zhang Guodong comes from a family deeply steeped in the martial arts. Both of his grandfathers as well as his uncles practiced the martial arts in the small village in Shandong in which he grew up. As a youth he trained in Shaolin, Hong and Plum Blossom Boxing and in 2007 he returned to the area to do field work on the local martial arts. Much of this work focuses on the reasons for the contemporary survival of these communities and their social function. The actual text of Zhang and Li’s article is rather brief, being only about eight pages long. Rather than a comprehensive statement of their research program (or even an outline) this particular essay addresses only the development and history of the Plum Boxing style during the late imperial period. Rather than focusing on the actual institutional history of various local lineages, the authors instead examined the geographic, economic, social and even religious variables that defined life in the aired villages of northern China. This systemic analysis allowed them to speculate on which factors could best account for the creation, spread and evolution of Meihuaquan. The introduction to their paper also foreshadows an interest in the urbanization and evolving popular culture of the region. Does this threaten Meihuaquan? And how can better understanding the actual circumstances of the art’s spread lead to the development of better strategies for aiding folk martial artists today. Throughout their paper the late imperial period is adopted as a lens to critically examine more contemporary issues. Unfortunately this paper has two immediate drawbacks. First, it does not appear to be listed in the electronic databases that I (and I suspect many others) use for my research. I was lucky enough to run across a copy of the paper of academia.edu, so I thought that a brief discussion here might be helpful. Secondly, while the paper was published in English, that is not the first language of either of the authors. In practical terms this means that in many places the actual text of the argument is awkward or hard to follow. One would certainly wish to have the paper carefully edited before publishing it in a western venue. Even with its short length it is not a quick read. Still, I think that many western students of Chinese martial studies will find this article to be useful given its subject matter. It is also fascinating to get a peek into the current Chinese martial arts studies literature. Meihuaquan at Liangshan. Source: Wikimedia. The first section of the paper begins with a brief institutional history of the style in which the authors trace its origins to Jiangsu. Here it appears to have been a family or clan centered style prior to its expansion into Heibi, Shandong and other northern areas. This geographic spread seems to have been facilitated by a change in the way that the art was taught, including the opening of the style and the recruitment of individuals in marketplaces and throughout the community. Apparently this transformation was already well underway by the reign of the Emperor Qianlong (1711-1799). Still, simple lineage genealogy cannot account for the popularity of this style in China’s northern heartland. Instead the authors turn to geographic and economic factors in an effort to divine the driving force behind the growth of the style. As Esherick among other observers have noted, these regions of Northern China were often at the mercy of the weather. It was not uncommon for years of drought to be followed by torrential rainfall that would cause massive loss of life through flooding. The regions flat landscape made this periodic flooding particularly difficult to predict or control. These basic geographic features had a profound impact on the economic and social development of the area. Famines were common and often led to surges in banditry. The area was also chronically under-developed. Landlords had little incentive to buy up fields that could be flooded without warning. On the one hand this meant that the percentage of the land owned by peasants was relatively high here compared to other parts of China. Yet farmers had no resources and few incentives to invest in improving the quality of their land. The yield per acre was relatively low in the region, and there were few handicraft industries or markets to sustain a secondary economy. Given the shallow nature of the economy poor peasants were often left with no alternative to banditry or tax revolts when the crops failed. The authors conclude that the Yellow River, more than any other variable, is responsible for the regions robust tradition of excellence in the martial arts. Too little water (famine) or too much (destructive flooding) caused waves of refugee displacement, vagabonds and bandits. This led directly to individuals turning to the martial arts as a means of personal protection in a chronically uncertain world. The authors do not rely on environmental determinism alone to explain the rise of Mehuaquan. They also turn to the social and political structures that defined the environment in which this style arose. While clans are seen throughout China, they are not equally strong in all regions. But Zhang and Li note that they were critical institutions in the region under discussion. The martial arts could be used as an expression of this common corporate identity, or as a way of projecting group power. Of course the Plum Blossom Boxing system itself was not a family style. In fact, it was known for its marketplace recruitment of students. Still, it made use of kinship terminology and enmeshed itself within these local systems. Next the authors turn to more Marxist theories of social change and ask whether we can detect a rise in “class contradictions” at the end of the Ming and Qing dynasty (both periods that saw a number of revolts). Unsurprisingly they discover that the answer is yes. As the expropriations of the “landocracy” (presumably the large landlords and government officials?) increase, full scale peasant revolt (as opposed to simple banditry) becomes more likely. I must admit that this section of the paper seems a bit forced. Given the vast swaths of territory and history that are under consideration it is difficult to know exactly which cases Zhang and Li are addressing. Yet if we are sticking with the area of Shandong in which the Boxer Uprising happened, we have already seen that rates of landlord ownership were very low by national standards. The area was just too risky to invest in because of geographic features. Further, it tended to produce few degree winners. As a result the local gentry class was extremely weak. Esherick argued quite convincingly that the outbreak of events like the Boxer Rebellion could be understood as a direct result of the critical weakness of these core institutions. Further, Elizabeth J. Perry has done much to problematize the simple dichotomy between banditry on the one hand and “pure revolution” on the other. Her detailed look at the Nien Rebellion (another northern uprising) was particularly constructive in this regard. In the final page of their article Zhang and Li turn their attention to the region’s folk culture and religion. If the area was sometimes cursed with poor economic development, it seems that it achieved riches in the realm of ritual, drama and entertainment. The authors report that between 20 and 30 distinct types of folk dramas were performed in each of these provinces during the Qing dynasty. Theatrical groups were a common fixture in both the countryside and larger towns. As a number of other authors have noted (including Esherick) the norms and ritual understandings of these performances seem to have had a profound impact on local society. 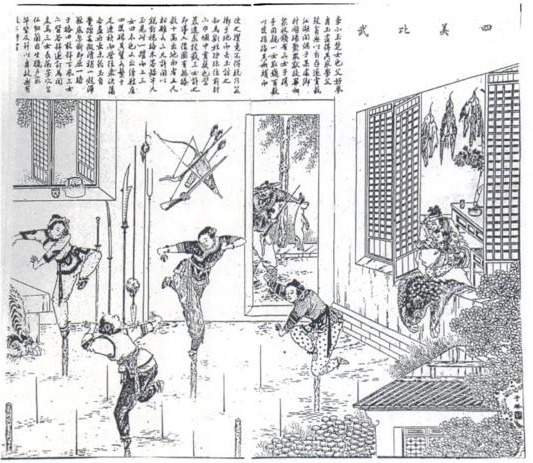 The popularity of military plays appears to have strongly affected the way in which the martial arts were viewed by the peasants. Zhang and Li claim that both local ritual practices and vernacular theater tended to strengthen local identity in the face of government oppression. They also seem to imply that the mixing of folk religion and the martial arts had a critical impact on the nature of local society. Yet these ideas are thrown out as simple assertions rather than being fully supported, or even developed. This seems like one of the paper’s biggest missed opportunities. 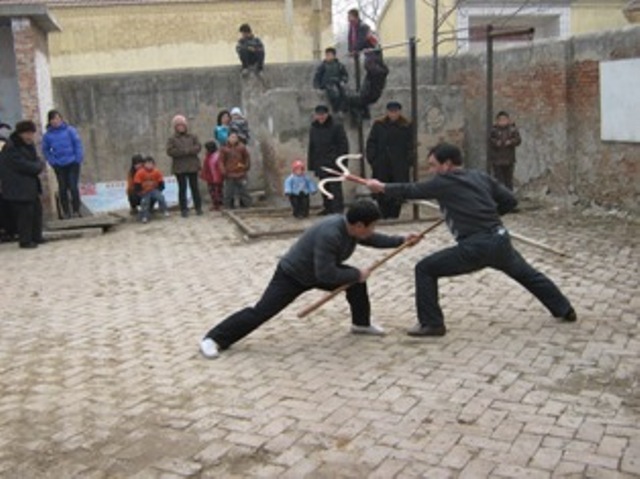 Mei Boxers weapons practice in Hou Zhuzhai Village (Puyang, Henan). Source: Personal Collection of Prof. Thomas Green. The authors conclude that the success of Meihuaquan was a result of two basic factors. The first was the grinding poverty of parts of Shandong, Henan and Hebei dictated by geographic features and violently capricious weather. Secondly, the turbulent nature of local society ensured that this poverty and backwardness would often find its expression in violent competition, both within communities and between them. No matter how one chose to draw the lines between youth gangs, rural bandits and village militias, martial arts instruction was going to be in demand. Plum Blossom boxing succeeded because it met the demands posed by this unforgiving environment. It provided an individual means of protection while at the same time reinforcing community identity and group solidarity (thus increasing the probability of collective security). At the same time it fed into, and helped to express, local religion and popular folk culture. In closing they note that if the art is to survive in the current era it must likewise find ways to help individuals accomplish their goals and express concrete social functions. All of this is true so far as it goes, but have Zhang and Li gone far enough? Almost all of the arguments contained in this short historical review will already be familiar to anyone who has read the works of Esherick, Cohen, Perry or Tai. At times I also wonder about the utility of such broad explanations. If the goal is simply to add texture to our understanding of the local landscape, such an approach is very helpful. Yes, Meihuaquan appeared in concert with each of these things. And they likely colored the way in which this art evolved and expressed itself. But does this imply causality? Let us consider this question from another angle. Shandong is not the only area of China to develop a strong martial arts tradition. Some flooding certainly happened on the Pearl River Delta in Guangdong, but rarely on the apocalyptic scale that periodically gripped the Yellow River. For that matter Southern China was one of the most economically developed parts of the country during the late Qing. Rather than a simple agrarian economy it was dependent on many types of trade and manufacturing. Yet it still managed to be a green-house for the development of hand combat styles. How do we know which sorts of economic or geographic variables are really causing the development of martial arts traditions versus simply being correlated with them? One obvious way of addressing this question would be to ask much more specific questions. Rather than asking why Plum Blossom Boxing was created or popularized I might instead take a look at more detailed aspects of either the institutional structure or the technical practice of the art. One could then ask how local conditions affected the specific expression of the martial arts in this area. Obviously such a project is beyond the bounds of what Zhang and Li were trying to accomplish in this paper. In some ways the article as it currently stands reads like the literature review section of a larger project. I, for one, hope that this is what it is. The concluding paragraph of this article ends at exactly the point that the author’s argument really begins to come into focus. Yet it offers no resolution. Can Plum Blossom boxing survive in a rapidly changing world? Is it still providing social goods, and if so, what are they? Can individuals turn to it in order to accomplish their goals? If not, what must change? While poking around on academia.edu I noticed that Zhang and Prof. Thomas Green have another article out on Meihuaquan which appears to look at the art in this more contemporary context. Unfortunately the text of this article was not in English. Yet it does give one hope for the future development of this research program. Thank you for this post. The breadcrumbs for my project led me here to this article, and I appreciate the point to Dr. Green and his work. That could be a big help in answering some questions I have. If anyone reading this article knows the combat application of the move in the drawing (Plum Flower Maiden Dancing from Pole to Pole) I am very interested in seeing it. That move shows up in a form known as Beng Bu in Tanglangquan. Mantis boxing originated in Yantai, and Beng Bu was created around the same time a split in the mantis line took place during the late Qing. Three separate lines branched off the main trunk in our 4th generation, two of which included Meihua in their name.